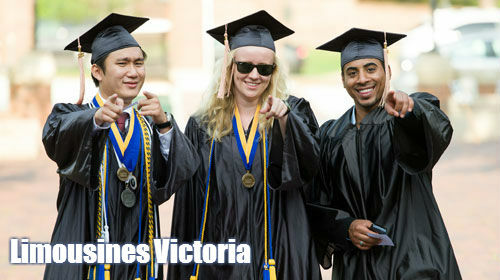 Graduation is one of the highlights for any Highschooler or College/University student. Make this moment one to remember with Limousines Victoria top notch services. With many options to choose from, arrive with your grad date or book out an entire limousines for your grad mates and gals. Jaws will drop as you all pull up with one of our luxury limos. ﻿1. Services to fit your schedule and times.﻿ If you need a limo ride between multiple locations, don't worry at all. Our services are time based and we'll be ready for you no matter where that is. 2. Rent with ease, we're professionals. Never rented with a limousine company before? Don't worry, our customer service staff is courteous and friendly to ensure your experience is a fun and memorable one. 3. Complete VIP Services. Receive the most prestigious services available. You'll be feeling like royalty before you know it with Limousines Victoria. 4. After Party services keeps your students safe. We understand that safety of students and children is a top priority. Our professionally trained staff will make sure your students arrive safe, every time. 5. Best prices in town. Don't go broke booking a "luxurious" limo service. Our competitive pricing will deliver booth Royalty treatment and pampering with the frugal pricing to keep cash in any student's pocket. ﻿Book your limo services today!